I'm back with another post! I love when I have repeat clients. One of them came back to me to get a makeover for her 30th birthday event. This is definitely a big deal and we wanted something fun and dramatic for her big night. My client pretty much left the look up to me. She knew she was wearing a gold dress and that she wanted something more dramatic than usual. I decided to stick with Metallics (MAC Flip, Mythology, and Amber Lights) because the bright finish has bold impact and the colors are easy to wear. We also made sure to do lashes - these ones were medium length and full volume, a new style that I got from the beauty supply store that I will definitely be repurchasing. 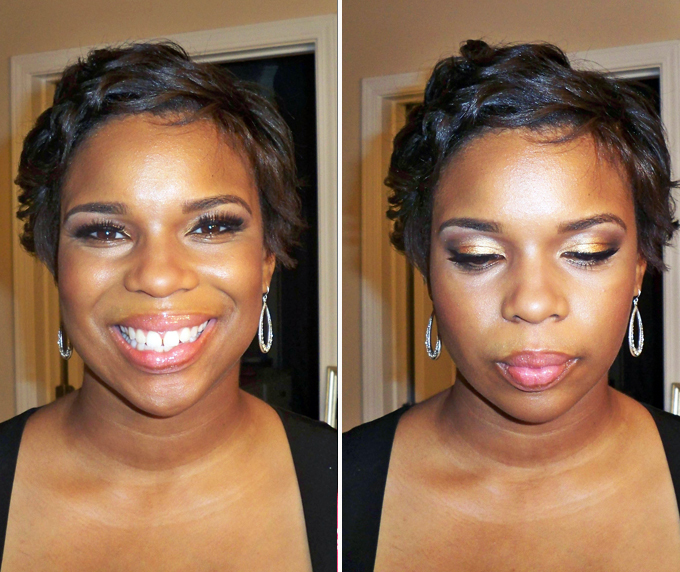 We kept the lips lighter since the eyes were smokey and I went for a dewy look because she has great skin. That's all for now, stay tuned for more posts! OMG she is GLOWING. u HAVE to do a vid tut on this look its just SO FABOLOUS! the colors are complimentary on all skin tones and EVERYONE loves a good natural, glowing look! u ROCK!